WASHINGTON, DC. — The American Hellenic Institute (AHI) is pleased to announce its newest publication, The Rule of Law Lobby: Grassroots Mobilization and the U.S. Arms Embargo on Turkey – 1974-1978 by Van Coufoudakis, Ph. D. and Serge Hadji, Esq. The volume focuses on the grassroots mobilization in the Greek American community following Turkey’s illegal invasion and occupation of Cyprus on July 20, 1974 through the lifting of the U.S. Arms Embargo in 1978. The mobilization events highlighted in the annotated Chronology recount how Greek Americans reacted to the invasion of the Republic of Cyprus by Turkey in 1974. In addition to protesting vociferously and providing humanitarian assistance, the Greek American community gradually coalesced into a lobby under the newly unfurled banner of the “Rule of Law.” This led to the remarkable accomplishment of cutting off military aid to Turkey under an arms embargo imposed by the US Congress. Van Coufoudakis is Professor Emeritus of Political Science and Dean Emeritus of the College of Arts and Sciences at Indiana University – Purdue University. Following his retirement from the Indiana system he served as Rector of the University of Nicosia in Cyprus and later as President of the Hellenic Quality Assurance and Accreditation Agency, an independent agency of the Government of Greece. His involvement in Cyprus dates back to the early 1960’s. 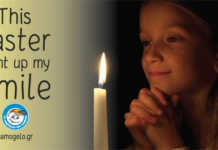 He became a member of the American Hellenic Institute soon after its founding in 1974. He has written extensively on U.S. foreign and defense policy in Southeastern Europe and the Eastern Mediterranean. His most recent books include Cyprus a Contemporary Problem in Historical Perspective (University of Minnesota, 2006), which has been translated in Spanish, Arabic and Greek, and International Aggression and Violations of Human Rights – The Case of Turkey in Cyprus (University of Minnesota, 2008). For his contributions to Hellenism and Hellenic letters, Dr. Coufoudakis was awarded the title and the decoration of Commander of the Order of the Phoenix by the President of the Hellenic Republic in 1998. Serge Hadji (Hadji-Mihaloglou) is a New York lawyer. 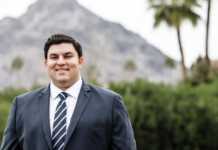 He started his career with Rogers Hoge & Hills, a Park Avenue law firm, and went on to become Senior Counsel of TRW Inc., a Fortune 100 multinational company. In 1974, Serge Hadji co-founded the Panhellenic (Emergency) Committee of New York – one of the grassroots committees that sprung up throughout the US to fill the political vacuum in the Greek American Community. Working with AHI, the Panhellenic Committee helped coordinate the mobilization supporting Congress in the Turkish Arms Embargo. 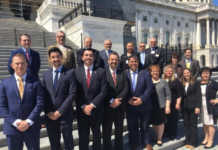 In collaboration with the Free Cyprus Coalition of Washington, DC, it took the lead in organizing the 4 National Marches (“Poreies”) in Washington focusing the huge and fractious New York contingents on lobbying for the Rule of Law. 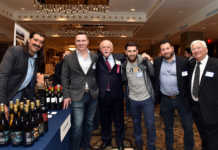 In New York, it was involved in contemporizing the national Greek celebrations and organizing mass mailings to Congress. Serge Hadji is the co-editor of AHI’s two volume service on Doing Business in Greece (AHI, 1999) together with Gene Rossides and Jim Marketos. 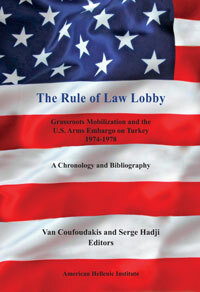 The Rule of Law Lobby: Grassroots Mobilization and the U.S. Arms Embargo on Turkey – 1974-1978 by Van Coufoudakis, Ph. D. and Serge Hadji, Esq.